Sexual Assault - a phrase that reshaped the year 2017 for us, all over the world. Little did Harvey Weinstein know that the first allegation against him, was the much-needed nudge that women in Hollywood needed to get the dominoes flinging, one by one, to confess the painful ordeal each of them had gone through, to make a career in the film industry. The #MeToo campaign spread like wildfire, becoming the unstoppable force for bringing justice to the skewed system in place. The list of offenders then came unfurled, the influential names in Hollywood, including the likes of Kevin Spacey, dropping like flies and having their pedestals demolished by the media around the world. It was a year of devastation but it definitely came with the promise of a better future and a new beginning. That light at the end of the tunnel was brought forth by the powerful women of Hollywood who launched the very first anti-sexual harassment plan called 'Time's Up' - an initiative to combat systematic sexual harassment in workplaces. Over 300 women in film, television, and theatre, including Reese Witherspoon, Selena Gomez, Blake Lively, and Gal Gadot, came together to set up a plan to address "the systemic inequality and injustice in the workplace that has kept underrepresented groups from reaching their full potential". For Hollywood, the year 2018 definitely started out on the right note, and we can only hope for the system to be firmly set in place to help out those affected by sexual harassment in their lives. While the #MeToo campaign made its presence felt in India as well, not much was done to weed out the prevailing sexual harassment in the Bollywood industry. 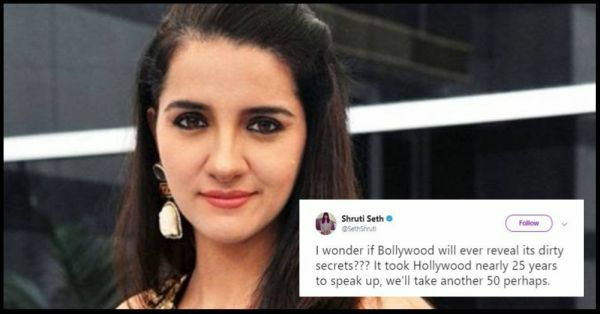 Right after the 'Time's Up' initiative was reported by the media, actress and VJ Shruti Seth took to Twitter to express her opinion on how long it will be before Bollywood takes a similar stand against sexual assault and safeguard its women in the country. While actresses like Pooja Bhatt and Richa Chaddha have stated that there exists an equally repulsive number of Bollywood's own Harvey Weinsteins, not a peep has been made against them, nor has there been any action taken to expose them out in the open. Richa has also mentioned that she's ready to mention names if she's provided with security upon her doing, but mum's the word so far. Even if these actresses take a step in the direction of justice and reveal the names of the offenders, the onus is on the authority in place who will ensure they aren't harmed or their careers ruined in the process. Do we have such figures, those who can protect women and not let powerplay, religious beliefs, offended sections of the population, or the money game get in the way? Will women ever be safe from any of these issues that are constantly thrown at them, on a daily basis? In a country where a party is ready to chop off the nose of an actress for playing the role of a fictional character without gathering any evidence whatsoever, and offer a bounty for her head on a platter - I highly doubt it.